Just got the new plates for the Tenkaramobile. Can you guess what car it is? The first person to answer what car this license plate is on will receive a box with 6 flies that I’ll personally tie. – update: the prize has been given. UPDATE (11/29): Most people were super close! I actually agonized for days on whether to put the plates on my Subaru Outback, which really is the mountain car, or on the Prius which is my environmentally-friendly business car. In the end the “TENKARA” plate went on the Prius, and Paul will be getting the flies – Paul, send me an email with your address please. 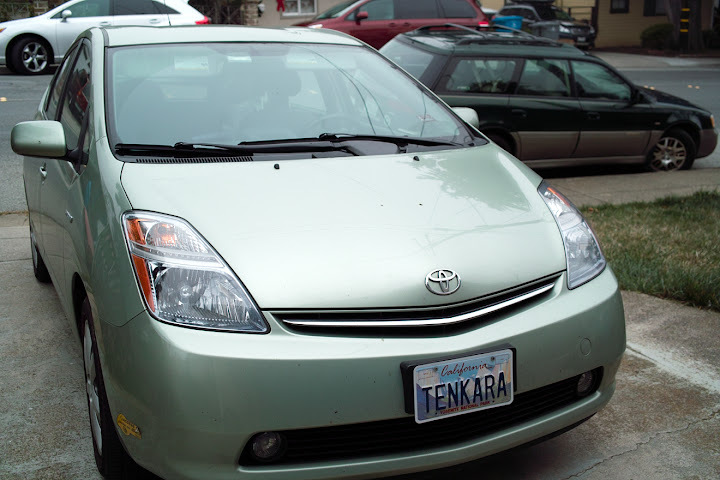 I use the Prius much more than the Subaru these days, so it will get more visibility for the tenkara plate. It’s also the car used for business purposes; it started as a vehicle for running errands around town, going to business meetings, etc, but then it was hard to not take the Prius on the longer fishing trips – ah, the pleasure of getting 43 miles per gallon! Even though it has much less clearance and is not a 4WD, it’s hard to beat the gas savings. Although it’s nice to have clearance and 4-wheel traction – and a couple of times I thought I would get stuck in places where I was so used to driving into with the Subaru without a second thought – most places don’t really require 4WD and high-clearance and the Prius has proven trustworthy as the tenkaramobile. got to be a subie, maybe a forester? Let me up the ante here. I’ll tie a box of 6 tenkara flies to the first person to correctly answer what car has this license plate. Your answers were very hot, but incorrect. shoot, I think Sean is right. It’s the new prototype Subaru Ito. It is noted for it’s very soft, smooth ride, but its real claim to fame is that it cleverly extends from a 2-door to a 4-door. I just thought Ecto–1 from the Ghostbusters. Impreza WRX is my guess I could see Daneil driving that car. With all those trips to Montana, Utah, Colorado, etc, my guess is the Tribeca. Thanks Daniel! I’d polish off my Japanese for a bit of a response but unfortunately most of my 3 years of high school classes have faded from my memory. Arigato gozaimasu. or Domo arigato to quote styx.